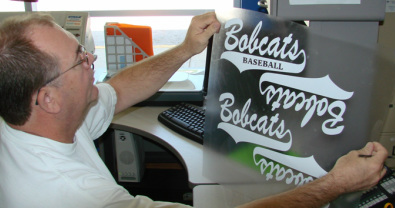 CAD-CUT is a system for producing custom heat transfer graphics to garments. Having just a few items screen printed can be costly. For smaller orders or custom one-of-a-kind items, CAD-CUT is the best option. We can produce t-shirts, sweatshirts, hats, staff shirts, shorts, sweatpants, nylon jackets, team banners, pennants - thousands of design possibilities are available at affordable prices.